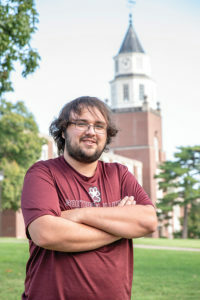 Max Goins is a senior from Herrin, Illinois, studying history. I enjoyed watching the History Channel as a kid a lot. I also liked going through old photographs of my town Herrin. What was your reaction when you received the Bertrand scholarship? Since this will make it easier to further my education, I will be able to share my knowledge with others. I would like to thank them for helping me and allowing me to further my education. Why should donors consider establishing a scholarship fund for students? If you can help students then they can then give back to the community one day. Has receiving this scholarship inspired you to give back to SIU in the future? I believe all scholarships make people feel inspired to give back. It really just sparks the giving chain and makes you truly happy.